Marvel vs. Capcom 3 fever is burning us up here at Saturday Morning Arcade and we are ready for MORE! Now I can personally go on and on about why Phoenix Wright should be in the game as a fighter, but I have been assigned a different task(master). 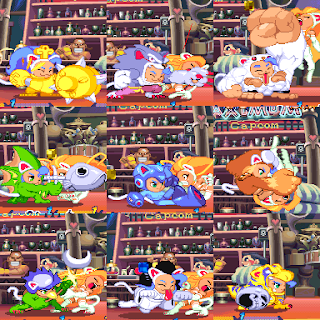 So here is another round of DLC wishing and, as you can see from the picture above, I am giving the girls of Darkstalkers the dress up (or dress down?) they deserve. I am not a pervert, I swear. She is the "Ryu" of the Darkstalkers series and has appeared in seven fighting game crossovers. That's more than the number of actual games in her original series. That being said, what happened to her fun personality? We need some cosplay Morrigan to return! Sure it might mess up with the hitboxes, but I'm sure Capcom could make it work somehow! Other than that, Capcom please give us Morrigan's inner-self. A Lilith Aensland skin would be awesome. The only major change would be the cleavage cover and the short purple hair. Although seeing Lilith's Gloomy Puppet Show in 3D would be amazing. DLC character, perhaps? Yeah, probably not. If Morrigan is the "Ryu" of the Darkstalkers series, then Felicia is "Ken". There is no doubting the popularity of the semi-naked catwoman so her appearance in Marvel vs. Capcom 3 isn't too shocking. She appeared alongside Morrigan in other fighting games including Marvel vs. Capcom 2 and Pocket Fighter. On that note, her flash combos in Pocket Fighter consisted of her in various costumes. Other than changing from Rikuo to Sasquatch from Darkstalkers, one of her flash combos has Felicia shooting a blast from a mega buster in a Mega Man costume. If people want classic Mega Man, then put this costume on her Capcom! Troll away! It's also interesting to note another one of her flash combos in the game. Star Gladiator! For those who do not remember (or know), Star Gladiator was Capcom's first 3D weapon-based fighting game. For those who played Marvel vs. Capcom 2 you may remember Hayato, who was Star Gladiator's only representative. While Felicia does not have a Hayato costume, she does pay tribute to the series he starred in. Ghost? Chinese zombie? Edith Scissorhands? Who cares. Hsien-Ko grabbing a spot on the Marvel vs. Capcom 3 roster made all those John Talbain fans cry salty tears. The game, however, isn't her first step outside the Darkstalkers series. 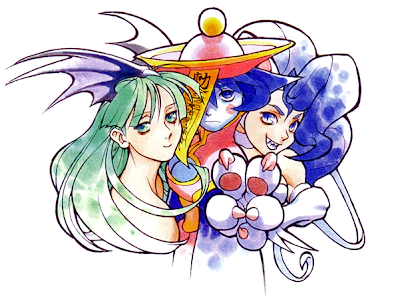 She appeared in Pocket Fighter to complete the Darkstalkers fan-trinity and the various SNK vs. Capcom Card Fighters games and NamcoXCapcom. Looking at Hsien-Ko's alternates, one color scheme is missing. Where is the yellow and orange robe inspired by her twin sister Mei-Ling? 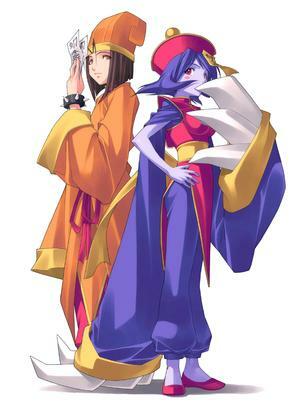 Instead of fully adding Mei-Ling as a character, paint Hsien-Ko's face white and add the orange robe and hat to make her twin an alternate. As for the ward-paper in front of the face? Turn it red, purple or blue to represent Lei-Lei.